Northants new boy Andy Carter revealed he was on the road at 5.30am before producing a superb debut display at Worcestershire. Carter claimed three for 51 as Northants bowled Worcestershire out for just 188 on the opening day of the Specsavers County Championship Division Two clash at New Road. Nathan Buck grabbed three for 53, while Muhammad Azharullah marked his first appearance of the season with two for 35 and Steven Crook registered the same figures. 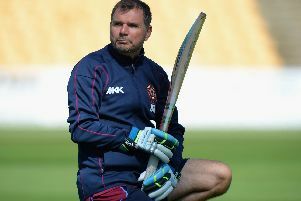 But Northants, who were without the injured Rory Kleinveldt and Ben Sanderson, as well as skipper Alex Wakely, for family reasons, found it tough with the bat. David Ripley’s men finished the day on 102 for six, 86 runs behind but with opener Ben Duckett still unbeaten on 45. Carter was the day’s big talking point though, with the former Nottinghamshire right-arm medium pace bowler having come out of retirement to hit the headlines. “I had a few phone calls from a few different people saying I had stopped playing too early so I thought I’d try and give it another shot,” the 28-year-old said. “I played for the seconds last week and took five wickets. “They have got a few injuries this week so I’m having a game! “I’ve been working for a good friend as a self-employed tiler. That is what I’ve been doing since October. “Yesterday I was on a building site until five o’clock. I drove down to Worcester at half-past-five this morning. “They rang me yesterday afternoon saying they had got a few issues and they didn’t now what the pitch was like and said ‘can you come down?’.